Hope your day has been good! What a wonderful day. I took a swim. Hubby is starting the grill now. Dogs are eating and happy. Kitties too. 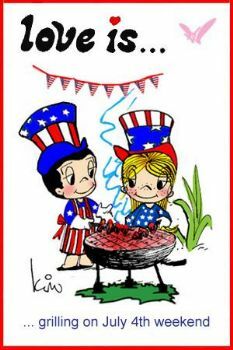 I hope everyone has had a fun 4th of July, and remain safe. We just had a fire right over the hill where we walk our dogs. Luckily the Firefighters are on notice, and put the fire out immediately. Fire Helicopters as well. The had the fire out within 20-30 mins. It's windy here, so it could have been worse. Firefighters are awesome! I hope you are all doing well. Kisses to the puppies! Glad you are all safe and going strong there! On Canada Day, July 1, I stood on the shore of the lake and watched all around me as several cottagers lit up the fireworks. It was kind of like they were taking turns! A nice display. Spent the Fourth with a wild scared maltipoo. Glad everything okay. We are so fortunate to have such wonderful first responders - in this case the firefighters. Sounds like it's going to be another bad summer for wildfires. Sounds like you had a fine day - yay! glad you had an day! I am glad they doused it before it spread. Enjoy your family time. Sorry it was so close. Hope your dinner was great. Glad that wild fire was tamed so quickly !! a lot of people putting their lives on the line to protect the world we live in. the rest of your day sounds like a piece of heaven . Fire is a scary thing, so glad that you have a great response team on hand! Kudos to the firefighters!! putting the fire out quickly and putting their lives on the line every time they go out on a fire call!!! went to the neighbors and ate with them, then went where my horse is and sat her while local people set off fireworks. she did pretty good with the fireworks going off. there are more fireworks coming the end of the week. Thankful the fires were put out those Fire -ies are amazing people :) enjoy your day !! So thankful they got the fires out. Sounds like you had a fun day. We had neighbors over for a cookout and the weather stayed nice except for the heat. Glad you got in a swim. Yeah for the firefighters getting the fire out in a timely manner just a ways away from your place. As fr me my 4th of July has been spent travelling on the road , starting from Texas heading to Minnesota to visit family and friends for several weeks. It will be driving until sometime Saturday--with stops overnight along the way. Your day sounds much more enjoyable than driving all day. So glad they took the fire down so quickly!! Enjoy your cookout and the fireworks.